Pure Jaguar inside and out with a distinctive appeal. Excellent driving dynamics, even without the added performance goodies. Plenty of interior space and cargo room for the class. Some competitors offer more power and performance for less money. Safety is an unknown factor. Reliability is not as assured as with some rivals. Jaguar is well known for its mixture of bold, contemporary styling and old world appeal. This shows significantly in their sedans, including the 2016 XF. Like the previous generation, the new 2016 Jaguar XF holds a sleek, impeccable style that leaves no doubt about the car's luxurious build. The front fascia centers a wide, rectangular grille that is flanked by slim, peering headlamps, below which a trio of intake scoops and foglamp bezels reside. The XF's hood rises upward in a modest curve with a central tunnel rising up to accent the fender cuts that accentuate the muscular stance of the car. The overall body shape is unmistakably saloon in its styling, with a coupe'd rear end thanks to a fastback-style short deck. Body lines are subtle, but eye-grabbing and pull the car forward visually. The aluminum bodywork carries with it a sophisticated appeal that blends with the old world saloon styling and simpler greenhouse cuts to blend for a luxurious, smart style. It's a great look and the XF, alongside its larger XJ and other brethren, is unmistakably a Jag. The exterior excellence of the Jaguar XF is mirrors inside with a rich, luxurious experience that has a hint of panache. Roominess is improved inside this new generation of the car thanks to a chassis and drivetrain redesign that lengthened the car's wheelbase, providing more interior space between the wheel wells. Both headroom and legroom were gifted with this change. Surprisingly, it also increased trunk space. The front seating is excellent, even at the base level of the 2016 XF. Full adjustability and plenty of ergonomics are found within. Added fun from the car's pulsating red "start" button, rising shifter knob, and flip-open vents gives "Good day, Mr. Bond" action at every startup. Controls for driving are well-placed and easily accessed with most of them being obvious in their use, alleviating most of the learning curve required of a new design. Rear seating is excellent as well, though the overall size of this midsize sedan does mean that there will be some cramping for taller passengers in the rear. Considering the class, though, the rear seat's space, especially headroom, is excellent. The rear seats are split-fold with a ski passthrough as well, adding more versatility. The cargo space in the trunk is immense for the class, with just over 19 cubic feet being available thanks to improvements in torsion design to shrink the wheel wells. Cargo loading is low and easy as well, adding to its usefulness. 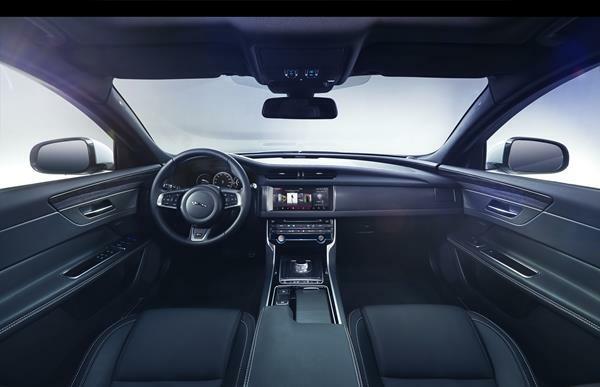 Technology in the 2016 Jaguar XF centers on the infotainment touchscreen with Jaguar Land Rover's app suite. An 8-inch display is standard equipment, as is a 5-inch driver information display in the instrument cluster. Bluetooth and other connectivity are there, as expected, as are several basic apps and in-vehicle controls. 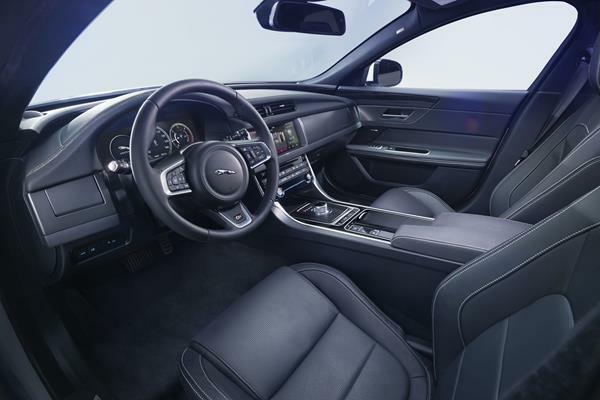 After the base level XF, the Prestige trim upgrades the infotainment to include smartphone app integration with the Jaguar Land Rover phone app as well as navigation (based on SD card data). This extended Jaguar app inclusion adds functionality like remote starting, music streaming from the phone's data, and more. Optional for all trims is a larger infotainment display that removes the side buttons from the standard 8-inch, making the screen 10 inches. Those buttons then move to become virtual buttons at the bottom of the new screen. This larger screen has higher resolution and improves some performance for app integration and music streaming. The Technology pack that brings this larger display also improves the audio and changes the gauge cluster to full LCD with customization options. Although the Jaguar infotainment system, even at its best, is not as robust as some rivals, it includes all of the things most people generally want and use and it works well, with an intuitive nature about it that makes it easy to learn. The 2016 Jaguar XF has strong fuel economy returns, which come thanks to the vehicle's lighter weight due to its heavy use of aluminum. The Jag's engines are all supercharged, giving more power for less displacement, which also aids fuel economy. In rear-wheel drive, the 2016 XF is EPA rated at 24 mpg combined (20 mpg in the city and 30 mpg on the highway) no matter the engine output. In our real-world driving of the XF in its base engine configuration, we found these to be doable numbers on the highway. The all-wheel drive option lowers fuel economy to 23 mpg combined, with the same 20 mpg in the city but with 28 on the highway. In the J.D. Powers and Associates Vehicle Dependability Study, the 2016 XF is rated as "About Average." Given the history of the brand and the recent improvements after the takeover of new ownership a few years ago, we are giving the XF a score of 7 based purely on that reputation improvement. Although the 2016 Jaguar XF has not received crash testing from either the National Highway Traffic Safety Administration or the Insurance Institute for Highway Safety, we are inclined to believe that it will do well on most tests. Given the car's improved structure and added safety options to include a full suite of active safety measures, we score it well here. The numbers that the Jaguar XF return are wonderful both on paper and in the real world. The engine in the 2016 XF is a supercharged 3.0-liter V6 that outputs 340 horsepower and 332 pound-feet of torque. An upgrade option boosts HP to 380, but leaves the lb-ft the same. Both engine tunes run through an eight-speed automatic transmission and can be had in rear-wheel or all-wheel drive. Jaguar has devised a traction and launch control system, called All-Surface Progress Control, and includes it as standard equipment in the XF. This improves traction in all types of driving conditions as well as providing better wheel grip during launches from zero. This can be enhanced with Adaptive Surface Response Mode on AWD models which include the adaptive suspension system. This further improves traction and control by sensing and responding to the road surface. In the Jaguar XF powered by the 340 hp engine option with RWD, we achieved average 0-60 mph times of 5.7 seconds. Jaguar says this car is capable of 5.3 in controlled situations and we're inclined to believe that. The higher HP rating and AWD boost those numbers further, we're told. 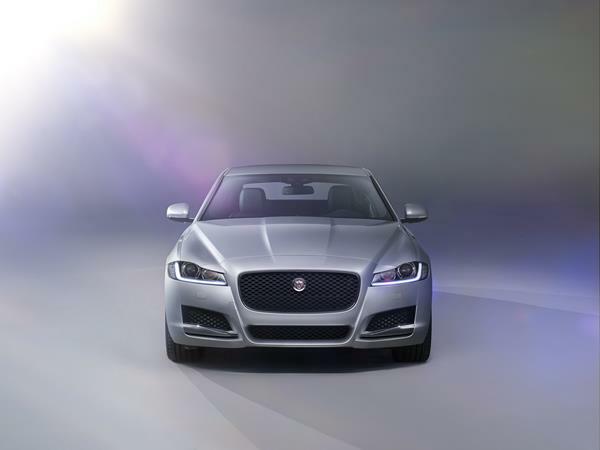 In everyday driving, the 2016 Jaguar XF has a companionable road presence. It cruises well at speed and is confident both in-town and on the highway. In performance driving, the XF delivers a solid appeal and plenty of driver feedback. Although not as tight and fast-paced in feel as its German rivals, the Jag definitely has plenty of goodness to bring happiness to those who occasionally like to romp the back roads. 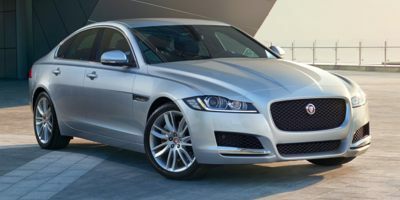 The 2016 Jaguar XF's starting price of about $52,000 is a bit higher than many of its contemporaries and included accoutrements are only marginally better by comparison. 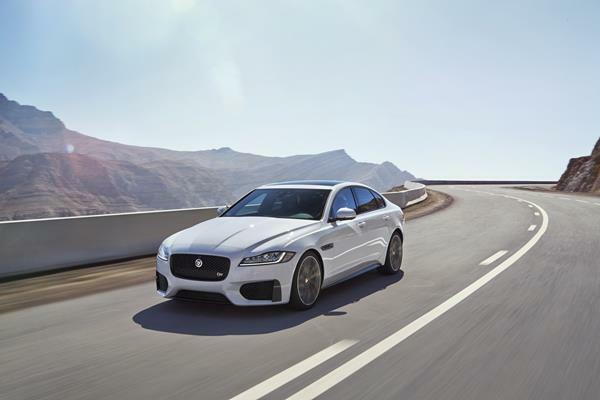 Yet its engine output and power are generally superior at this price point and in the upgrade options, including AWD and the next trim level, things swing back into the XF's favor compared to others on the market. A very well-equipped 2016 Jaguar XF can be had for far less than $60,00. Ownership costs are about average, though the requirement of premium fuel may put off a handful of buyers. For most, that is not going to be an issue given the car's price point. Few other vehicles on the market can claim the overall class, power, and beautiful interior experience that the Jaguar XF offers. There are no shortage of competitors in the midsize luxury sedan market. Definite performance competition comes from the Audi A6 and the BMW 5 Series, as well as the Mercedes-Benz E-Class. None of these will match the Jaguar's overall finesse and interior opulence, however, without adding a lot of pricey options. Those really focused on performance, however, may want to look at the surprisingly fast-paced and well-designed Cadillac CTS V-Sport, which rivals the Jaguar XF in interior excellence and offers a lot more muscle for a lower price. 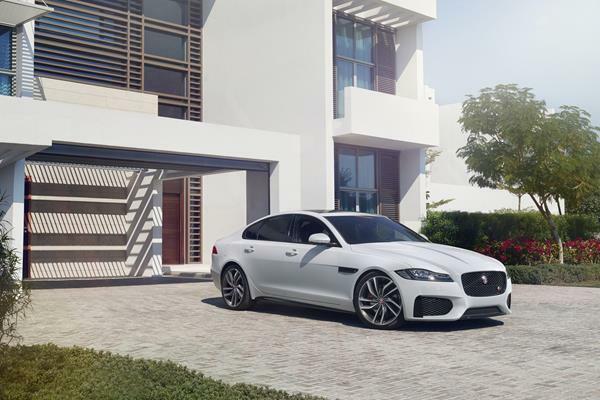 Compared to all of these, though, the 2016 XF offers grace, style, and excellence without compromise. It's a tough package to beat. Ever since Jaguar was purchased by Tata Motors and revitalized about decade ago, the British automaker has improved everything about itself to bring back its ancient roots. With focus on excellence of design, improved power, and high performance without loss of fuel economy, the company has really turned around. 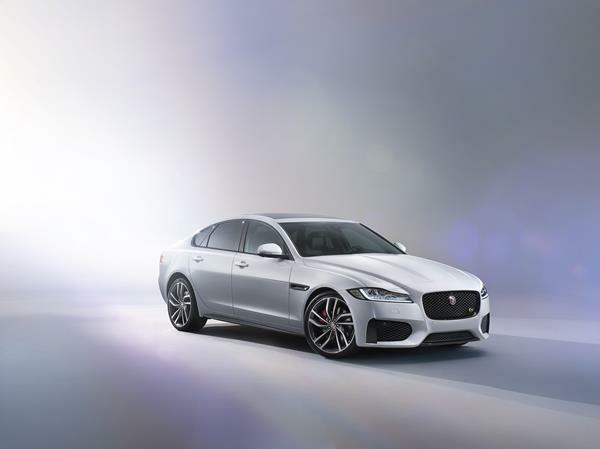 The 2016 Jaguar XF is an excellent example of what the designers in Coventry can do, bringing a beautifully packaged sedan that offers power and grace in a daily use design. 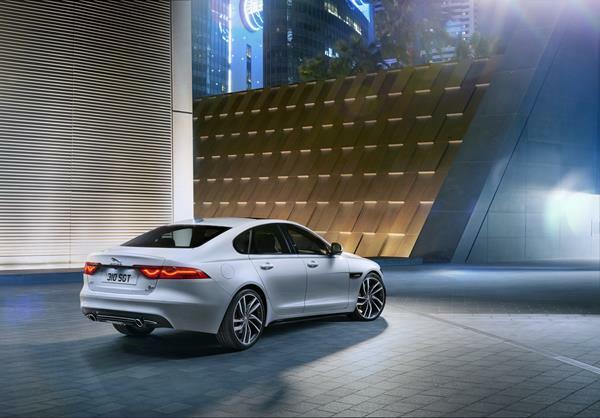 The 2016 XF is a wonderful, praiseworthy sedan. Interested to see how the 2016 Jaguar XF ranks against similar cars in terms of key attributes? Here are the 2016 Jaguar XF rankings for MPG, horsepower, torque, leg room, head room, shoulder room, hip room and so forth.